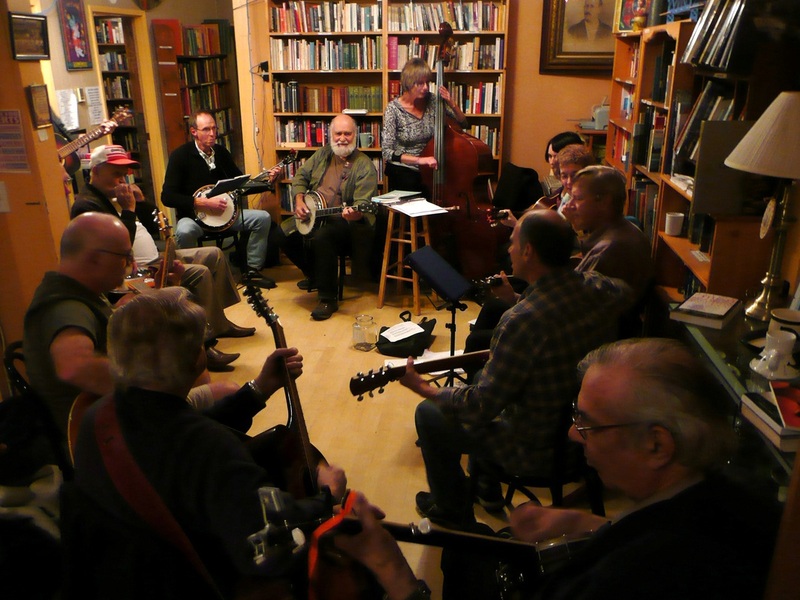 Bluegrass Jam Circle is Wed. Nov 7th 2018 ! Bring a $3 ($$$) to get in please. Friday Night Music is on a break until further notice. 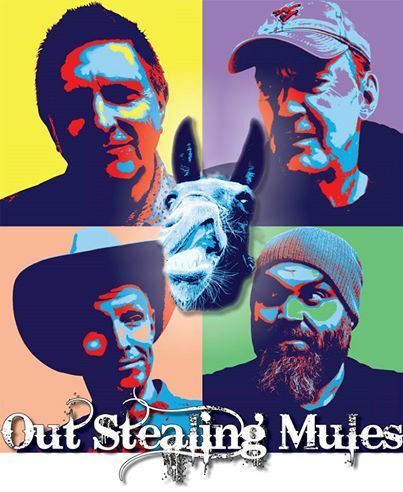 Friday Jan 22nd 2016 7 to 9pm Hokum Steamers ! Profs. Mike Ballantyne & Rick Van Krugel have joined forces to form the vibrant, dynamic, ragtime blues duo The Hokum Steamers playing good-time, authentic renditions of 1920s & 1930s ragtime blues, hokum & jug band songs citing historical place, time & context. Great fun, wholesome music, suitable for all Mike accompanies his rich, bass-baritone voice with 6 &12-string guitars; Rick, a master musician plays a wide variety of mandolins, sings, interjects & plays guitar … plus comb & paper. Kickin' off 2016 in style! Born and raised in Holland, Elies has been singing since Jan van Eyck was a lad. Her voice can best be described as a mix between Bonnie Raitt and Stevie Nicks and she gets a glow when singing Jazz, Blues, Rockabilly or Gospel .. Both Burke and Paul are both awesome on guitar and vocals. Peter Hawkins has been playing music professionally for 35 years. 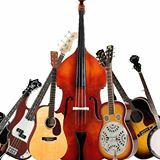 He covers a breadth of styles including Classical, Spanish and Finger Style, Rock, R&B, Country, Rock, Folk, and Ballads, to which he adds a few of his own originals. Pete has a silky smooth deep singing voice. He consistently wows audiences with his guitar playing. A crowd favourite!!! Please note that we have a new time slot 7 to 9pm on Friday. Open stage performers don't pay, but your roadies and entourage do. Visions of Gumbo: Chicago Blues A Tasty Night of Blues with Visions of Gumbo: Chicago Blues Unplugged guys are solid and sound like a combination of Taj Mahal, Howlin' Wolf, Muddy Waters - The Blues, Tom Waits, Freddie King. Rockin’, Fabulous, Foot Stompin’ Blues featuring Lonnie Glass on smokey, Tom Waits meets Joe Cocker, meets Leonard Cohen vocals and rock steady bass; Bill Holton guitar; Brad Hawkes percussion; Neil Trett harmonica. www.danandlaurel.ca Alt-folk duo Dan Frechette & Laurel Thomsen will be touring their "Honeymoon Tour of The West" to promote their Kickstarter-funded "New Disguise" second album pre-release! 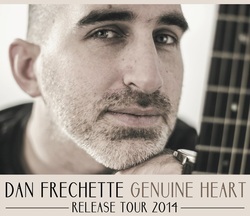 Hear a preview of "New Disguise" here: https://soundcloud.com/ramblingdan/dan-frechette-laurel-thomsen-new-disguise-preview-snippets A prolific songwriter, Dan Frechette’s songs have covered successfully by The Ploughboys (“Who Will Take My Place”), Dervish (“My Bride and I”), Emma Cloney (“My Canada,” “My Bride and I”), Jessee Havey (“Dance and Play”), The Duhks (“Who Will Take My Place,” “Mists of Down Below,” “You Don’t See It”), and The Buccaneers (“Everybody Loves You”). Laurel Thomsen’s path led her from Bach partitas and Beethoven sonatas to improvising, arranging, and recording for assorted bands and singer-songwriters. 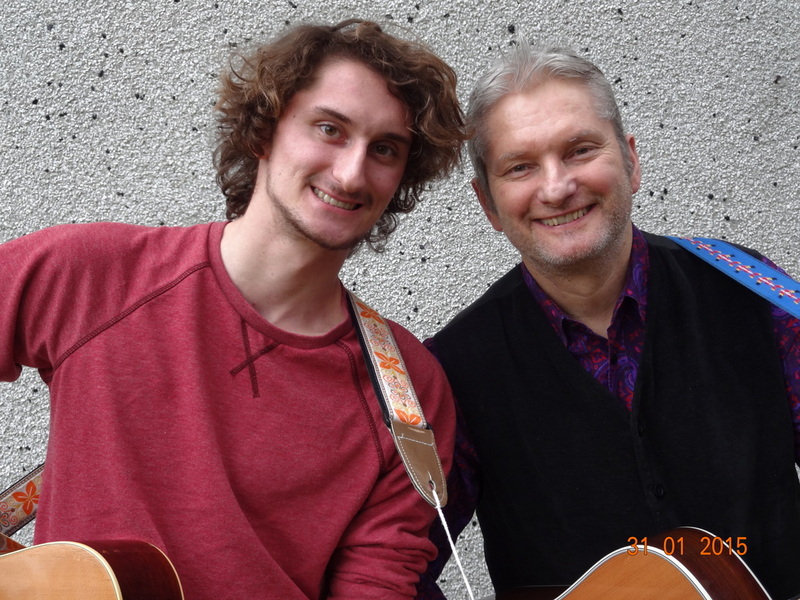 Jamie Dopp and Stephen Dopp are father and son singer-songwriters who feature strong vocals, thoughtful lyrics, and tasteful guitar and harmonic stylings. Songs for the young and the forever young. On Friday they’ll be especially celebrating the arrival of Jamie’s new CD Dallas Road. 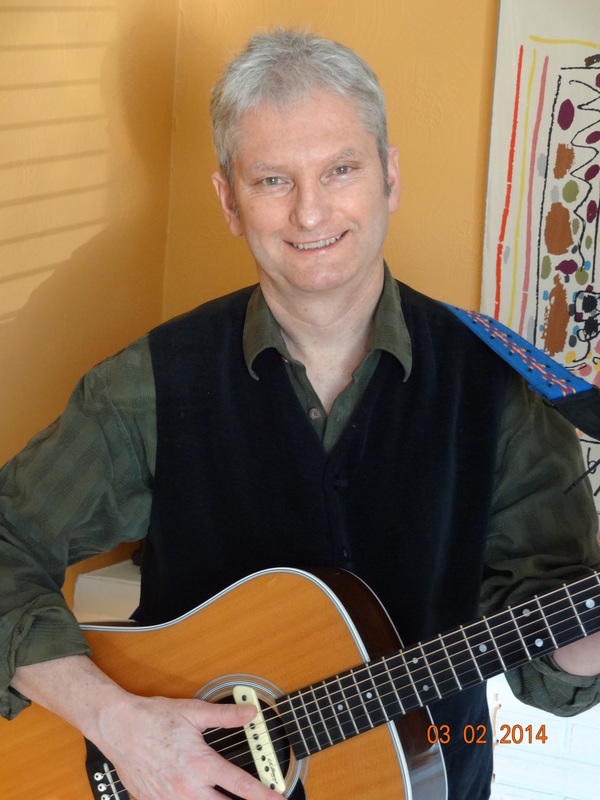 Peter Hawkins has been playing music professionally for 35 years. to which he adds a few of his own originals. Peter has a silky smooth deep singing voice. He consistently wows audiences with his guitar. Friday Open Mic and Feature Night: Open mic starts at 8, come EARLY to sign up. Feature at 9. 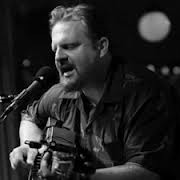 This Friday: Bluesman BILL JOHNSON Superb bluesman, Bill Johnson brings his West Coast Blues sound in an intimate solo setting. A master of the form, Bill has spent a lifetime immersing himself in the blues, starting his professional career at the age of 15. 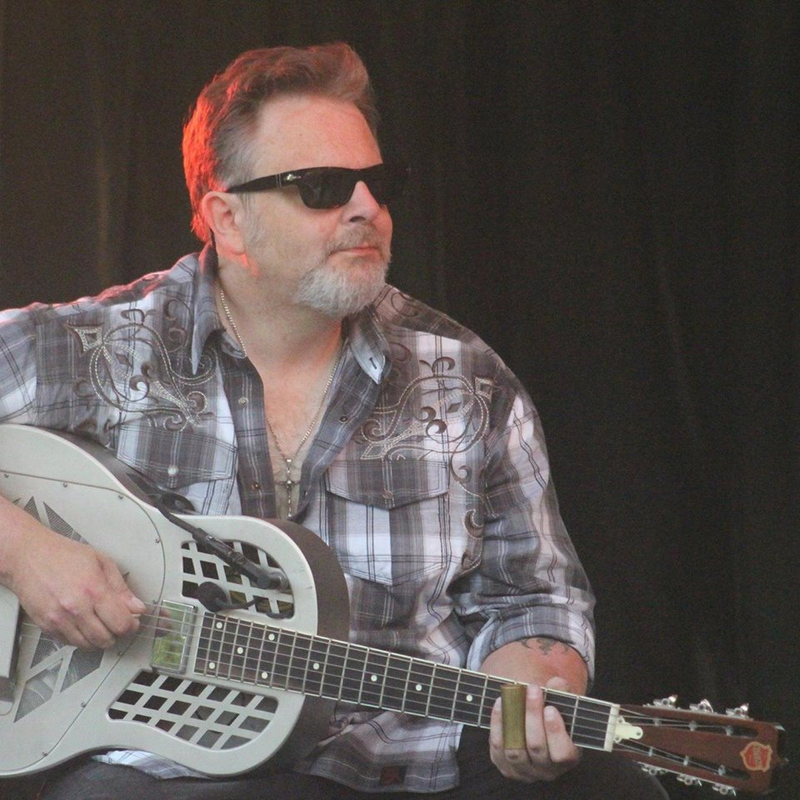 Bill Johnson’s work has gained him much attention and many awards including 2012 Junos, Best Album of the Year nomination for “Still Blue”. There WILL be Christmas Blues. http://www.rabbleberries.ca You can also "Like" them on facebook! For the Malahat SwingCats, it's all about making the music swing, so toes are tapping and fingers snapping.Drawing on a wide array of influences, the SwingCats play a unique melange of acoustic jazz. 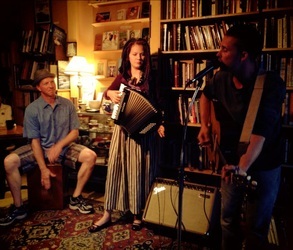 The quartet is comprised of two guitars, accordion and mandolin. Its songlist includes instrumental and vocal arrangements of gypsy, jazz, latin and swing standards, plus a number of original compositions. Malahat SwingCats play gypsy, jazz, latin &swing standards, plus originals. Add harmony vocal arrangements and you’ve got a toe tappin’ finger snappin’ swing music good time. 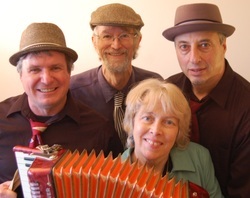 The quartet is: Arlene “AJ” Carson on accordion; Ira Smolkin & Eric Eder on guitars; Mike Sadava on mandolin. 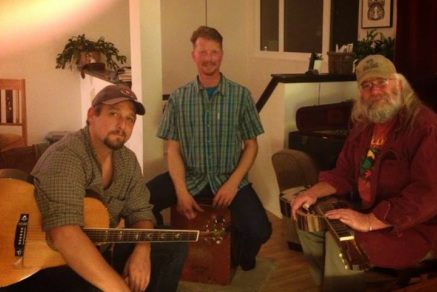 Friday Nov 7th 2014 Dan Weisenberger & Rick Van Krugel Dan Weisenberger is a multi-instrumentalist, songwriter, and composer living in Victoria, Canada. He has traveled all over North America and much of Europe, playing everything from street corners to concert halls. 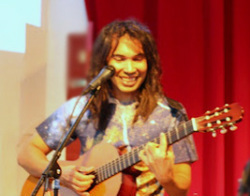 Besides composing music for television, radio and stage he has played slide, acoustic and electric guitars and electric mandola on recordings with Leeroy Stagger and Jeremy Fisher, steel and other guitars on a collection of Hawaiian-inspired songs sung by Ryan Beattie of the band Chet, and Portuguese guitarra with fado singer Sara Marreiros. He is currently working on a CD with North American fiddle champion, Ivonne Hernandez, with whom he has toured for several years. An album of his own music, Happy Nightmares, was recorded with The Beautiful Losers: Dan Weisenberger (acoustic guitar, resophonic guitar, harmonica), Rick Van Krugel (mandolin, twenty-cent saxophone), Leigh Grisewood (bull fiddle), and Tolan McNeil (guitars). Rick Van Krugel (happily married muse to writer Linda Rogers) is an entirely self-taught play-by-ear performer. He perfected his style of mandolin years before the instrument got trendy, without reference to other players or recordings, inadvertently earning him the title of Genuine Article. Fact: He cannot and does not show off - he simply plays, and its different every time. Rick's straightforwardly raw intuitive style is to be treasured in today's tech-obsessed culture. Having played over 45 years, he still loves nothing more than getting behind a good song. His first music was jug band, 1920's and 30's southern roots jazz/blues. 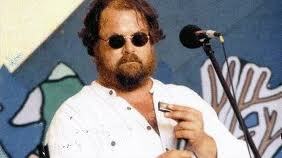 Jug band, a little hokum, and rural blues are at his core. Though he has known and tasted musical history on and off stage with some true legends (including Mississippi Fred MacDowell and John Hammond Jr.), he elected long ago not to take it on the road as a way of life. Having chosen domesticity out west in Lotus Land is rather antithetical to being a bluesman, so Rick is one of Victoria's secrets, a semi-mythical underground character who keeps his chops up performing everything he can get his fingers on, from Celtic to country to pop. He possesses (is possessed by!) the gift of a true artist: his inner voice lives in his work. Rick was recently informed that, having entered his sixties, he is now officially classifiable as Authentic. Friday Oct 31st 2014 Halloween! Chicago Blues Unplugged featuring Lonnie Glass on smokey, Tom Waits meets Joe Cocker, meets Leonard Cohen vocals and rock steady bass; Bill Holton guitar; Brad Hawkes percussion; Neil Trett harmonica. ﻿﻿﻿﻿﻿﻿And it's....﻿﻿﻿﻿HALLOWEEN… dress as a Pirate; dress as a Vampire perhaps a VamPirate. Or just come as your own sweet self ! It doesn’t matter what you wear, just as long as you are there!!! Without A Net perform an eclectic mix of traditional Klezmer music and cleverly penned original songs, featuring David Lowther on vocals, guitar and banjo and Mary Lowther on clarinet, flute & saxophone. With insightful and witty social observations, Without a Net perform up and down the islands, and are regular features at the yearly features at the annual Golden Piggy Awards. 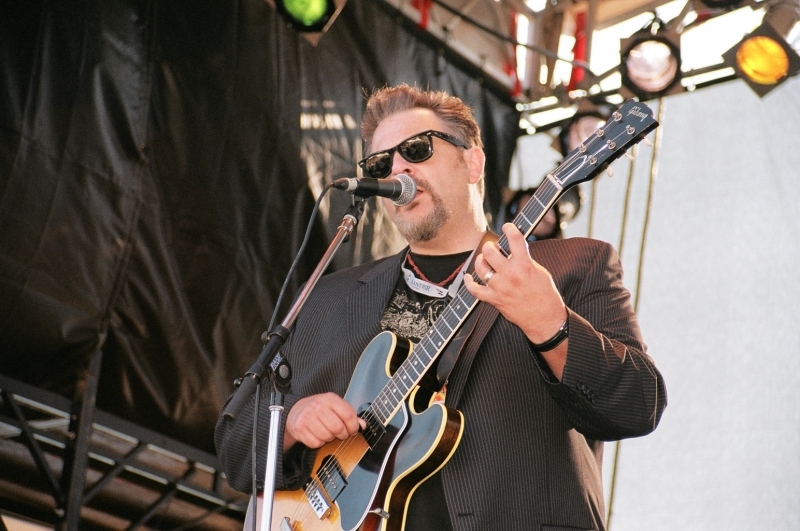 Steve Leztec has been a well known member of the Victoria music scene for many years & is both loved and respected for his commanding & rich vocals & guitar works. A gentleman's gentleman, Steve amazes listeners with his authentic renditions of music from Cash and Haggart, to name a few. 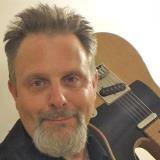 One of the co-founders of the local band "Roadstars", Steve possesses strong guitar, vocal & songwriting skills. He has written a number of poignant & beautiful ballads that proudly appear on the "Roadstars" CD. Steve will be joined onstage by musical guests. 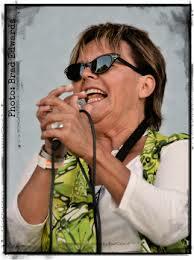 Rhonda Lou Broadfoot opens the season with rich, warm vocals, percussive rhythmn guitar and harmonica. 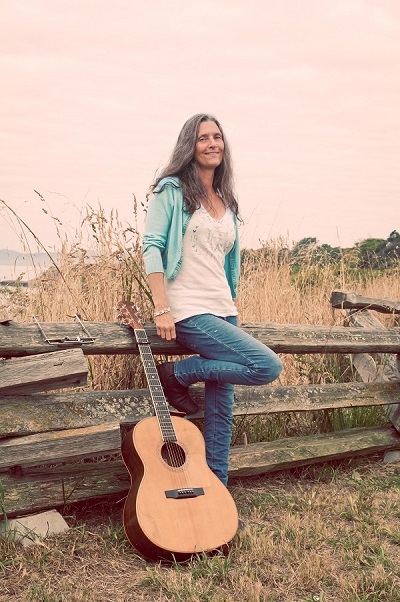 Her well crafted, uplifting originals plus uptempo covers, deliver elements of pop, blues and folk rock. Superb bluesman, Bill Johnson brings his West Coast Blues sound in an intimate acoustic solo setting. A master of the form, Bill has spent a lifetime immersing himself in the blues, starting his professional career at the age of 15. 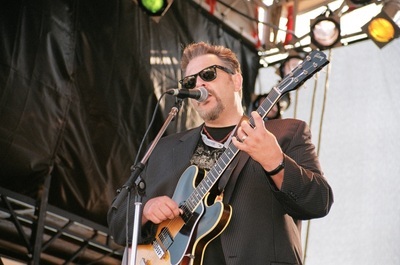 Bill Johnson’s work has gained him much attention and many awards including 2012 Junos, Best Album of the Year nomination for “Still Blue”. Calvin Cairns (fiddle, concertina and musical saw) is a well known Canadian fiddler, teacher and musical entertainer. He has performed in Russia, Europe, Japan, Australia, United Kingdom, USA and from coast to coast to coast across Canada. 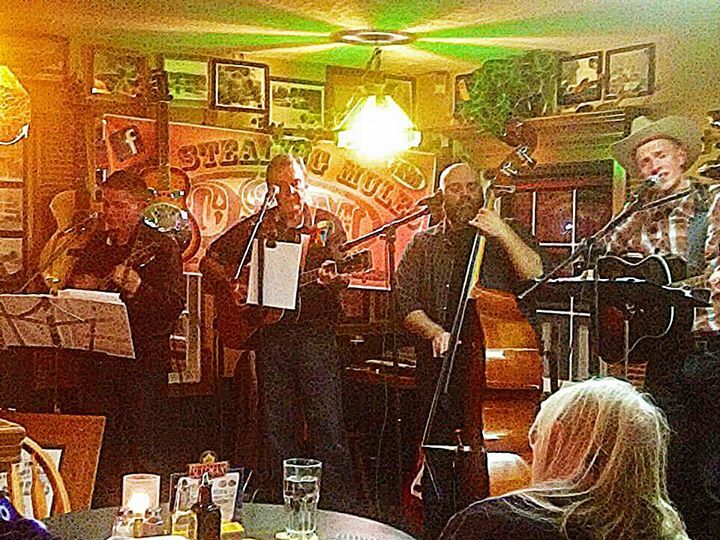 Singer-songwriter Paul O'Brien (guitar, vocals, bodhran, mando-cello) moved to Victoria from England several years ago and his music often reflects on life as seen through the eyes of immigrants. Together Calvin and Paul present a wonderful variety of Celtic inspired music old and new, and the audience is made to feel completely a part of the songs and stories. Jack Booker (right), fabulous voice & guitar playing, delight s the crowd with cool covers from the rock era, Beatles, R&B, power ballads & some of his own originals! Scott MacDougall (left) is great on guitar and vocals so there will be some wicked pickin’ duos. Jack & Scott have about 70 years experience between them playing music ! Lots of sing along opportunities. Should be fun! Having met one another in a guitar shop in late 2012, Sue Hansen and Rose Birney formed WireTap in 2013 to play songs from the Indigo Girls, Del Shannon, Bob Dylan, Parachute Club, Danny Whitten, Phoebe Snow and Luba. As youngsters their individual lives followed similar paths. By the late 60s /early 70s, both managed to get their hands on guitars. Their combined ages, rather, their combined experiences have developed a rap sheet too long to list. One thing remains clear and in focus for these amazing musicians is their love and respect of the magic and fun of music. Those invisible wire-vibrations might just ignite your vocal chords. Join in, tap along, and connect in the spirit of song and fun. 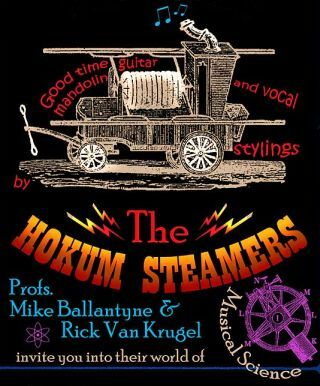 After recording and playing separately for more than 45 years, Mike Ballantyne and Rick Van Krugel have joined forces to form the vibrant, and dynamic, ragtime blues duo The Hokum Steamers. These seasoned entertainers deliver good-time, authentic and definitive renditions of 1920s & 1930s ragtime blues, hokum, jug band songs and gospel, and give their songs historical place, time and context. It’s great fun, and wholesome music, suitable for all. 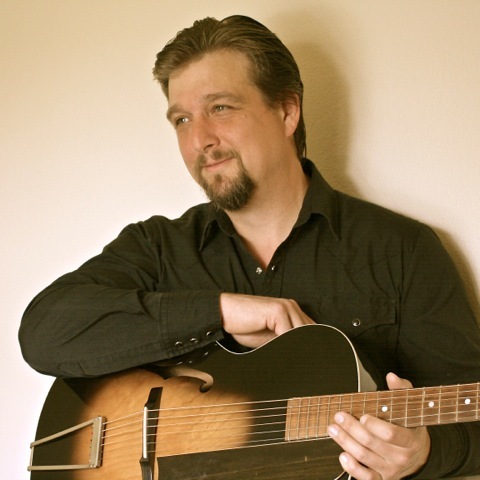 Mike accompanies his warm, rich, bass-baritone voice with dexterous playing of both 6 and 12-string guitars; Rick is a master musician who plays a wide variety of mandolins. 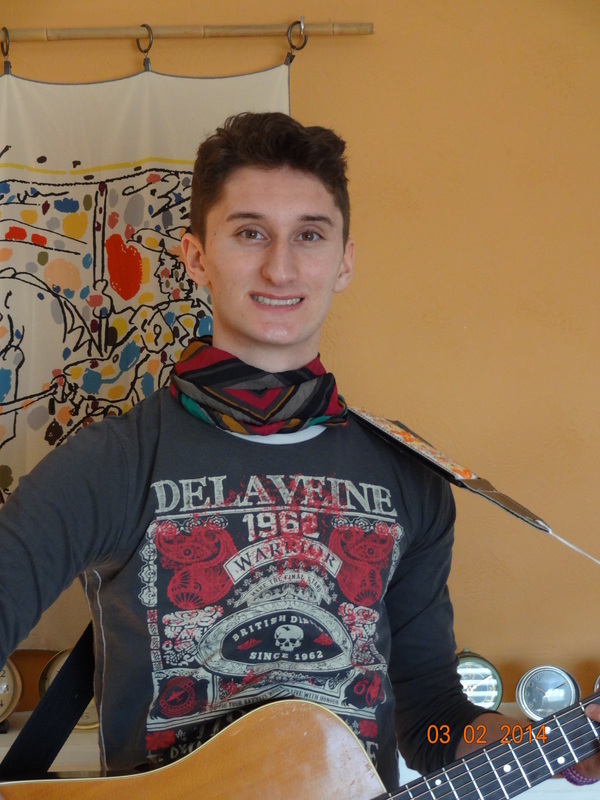 He also sings, interjects and plays guitar. Paul O’Brien & Sons Friday July 25th Paul O’Brien, singer/songwriter multi-instrumentalist takes his audience from foot stomping energy to the absolute stillness of choked-back tears. 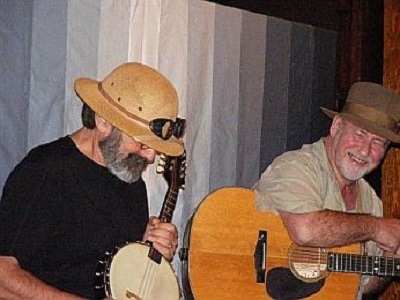 Joining Paul are his sons Fintan and Cormac, very talented musicians in their own right. Come enjoy Daniel Cook's original West Coast Root music. 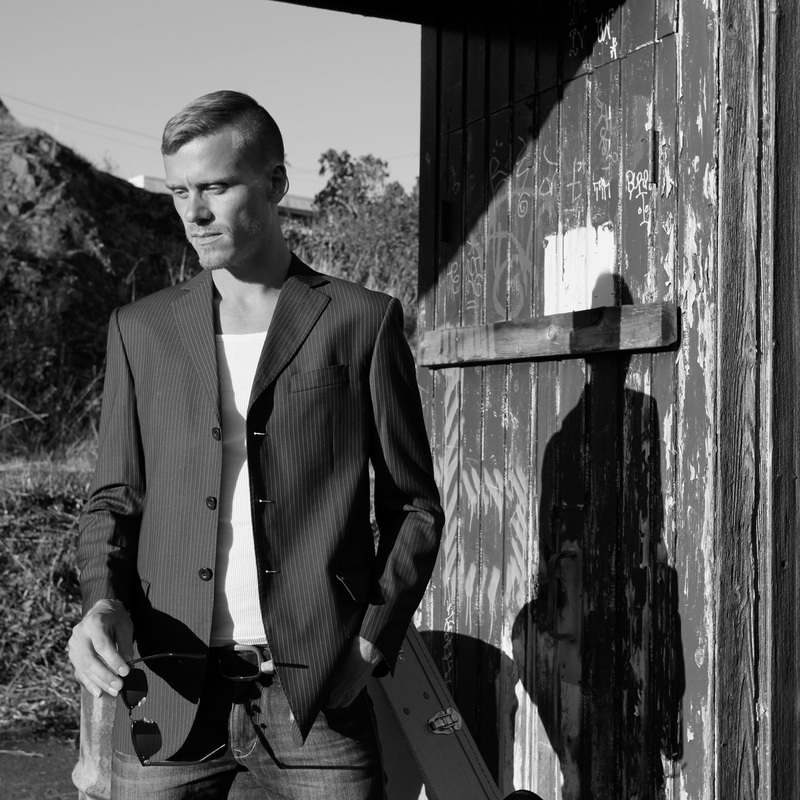 Singer songwriter Daniel Cook fuses contagious melodies with timeless stories creating a fresh brand of original West Coast roots music. 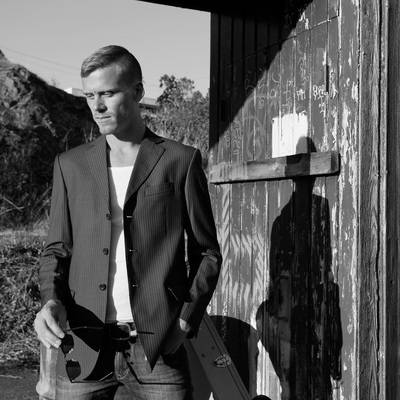 Dan's guitar work blends melody and minimalism into a sweet mix of jazz and country guitar traditions. 2014 marks a new era for The Blackwood Two. Megan McCaffrey (fiddle/vocals) and Dan Belgue (guitar, clawhammer banjo, vocals) have been performing their unique brand of old-timey folk-grass together for over four years. 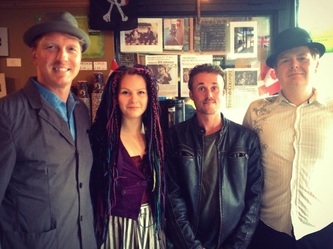 Growing as players, writers, and performers, their sound has evolved significantly since the day they met busking on the streets of Victoria, BC. They’ve taken their signature style of folk music from coast to coast multiple times, including stops at festivals such as ArtsWells (Wells, BC), Winterfolk (Toronto, ON), Vancouver Island Music Festival (Courtenay, BC), and more, as well as participating in Via Rail’s ‘On Board Entertainment’ program performing on trains from Toronto to Vancouver. 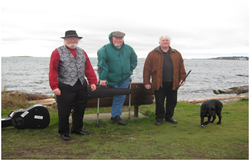 THREE WIDE MEN play a combination of original songs and fiddle tunes, as well as contemporary folk and celtic music. 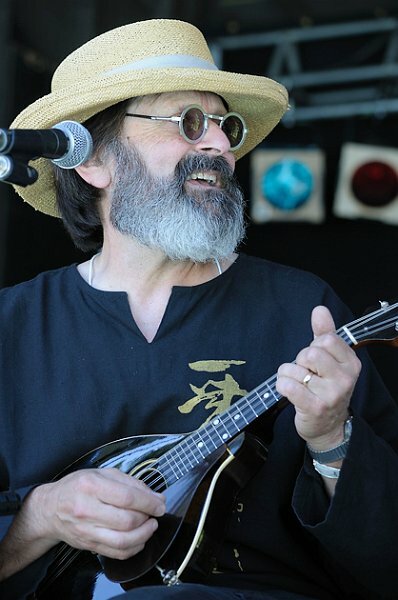 Our style of playing is casual and laid-back, meant to make people feel relaxed.LES McADAMS, vocals, guitar & mandolin Les is a long time folkie and songwriter, with a wide repertoire of songs from Celtic to contemporary. His motto is "that's good enough for now". KEITH MALCOLM, Fiddle Keith currently plays music for English Country Dances and contra dances. He has played the fiddle since he was eight years old, and has also composed many fiddle tunes. DENIS WIGHTMAN, pennywhistle, harmonica & bodhran Denis grew up in Belfast, Northern Ireland & so has a broad background in Scottish &Irish music. His favourite bands are The Chieftains & The Corries. 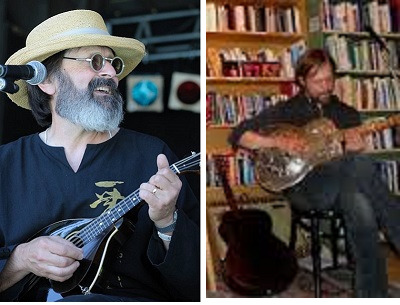 BEATS WORKIN Trio features the extraordinary and versatile David K. on guitar, dobro and 7 string slide guitar; Mark Johnson ... a very fine upright bassist; and Bob de Wolff on guitars, and they sing too! They are performing some of David's and Mark's originals songs (which go from roots to latin), blended with Bob’s Swing and Jump Blues. Singer-songwriter guitarist Zac Doeding performs original songs about love, family and politics with a unique style and delivery combining folk/alt/country/pop with a healthy dose of finger-picking. 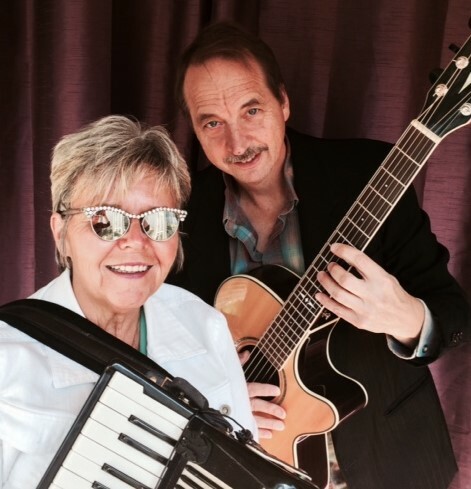 Accompanied by award winning visual artist and musician Sherie Welsford on mandolin, guitar, percussion and vocals, and special guest, veteran steel guitarist Bill Negraeff. 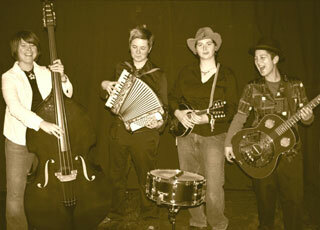 OzMoses new 4 piece acoustic string band with great vocals brings new country, folk pop, and cool vintage. Each of the members of this eclectic musical entourage hails from a different part of the known universe. "Maestro" Michael Eckford, singer, actor, janitor, journalist, eco warrior, teacher, funny nice guy, graced with a seriously big beautiful voice, performs the Doors to Kermit the Frog, Bobby McFerrin style Improv to Italian Opera. Michael is witty and talented, has a vast musical repertoire, and is rather eccentric in an entirely fun & charming way, adding up to what promises to be an entertaining evening! 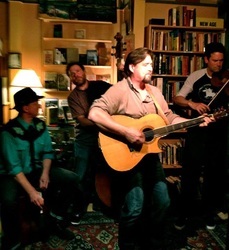 the Mike Sadava Band plays folk music heavily infused with country & bluegrass, with a little swing added to the mix. Mike is also a journalist who’s lyrics brings humour & insight diverse subjects. Mike Sadava guitar, vocals Arlene Carson accordion Rick van Krugel mandolin. Superb bluesman, Bill Johnson brings his West Coast Blues sound in an intimate solo setting. 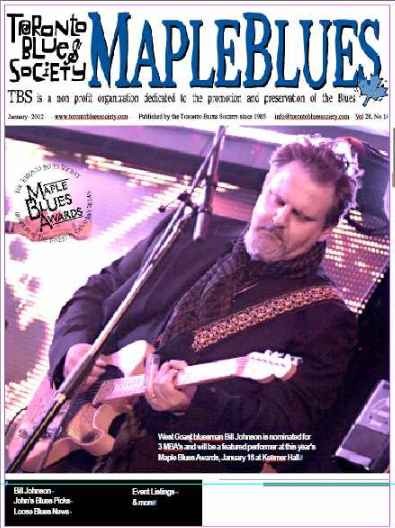 A master of the form, Bill has spent a lifetime immersing himself in the blues, starting his professional career at the age of 15. Bill Johnson’s work has gained him much attention and many awards including 2012 Junos, Best Album of the Year nomination for “Still Blue”. Barley Wik sing like angels and play an array of acoustic instruments like they sold their souls to the devil. The all-female band reinvents old-time music with an impressive collection of well-crafted original songs that reshape folk and country with a little twist of bluegrass. The band’s name comes from the 15th century term bailiwick, a reference to someone’s area of authority. It’s a place where someone can have their say, and Barley Wik’s members have their say as a collection of individuals with wildly eclectic musical influences. 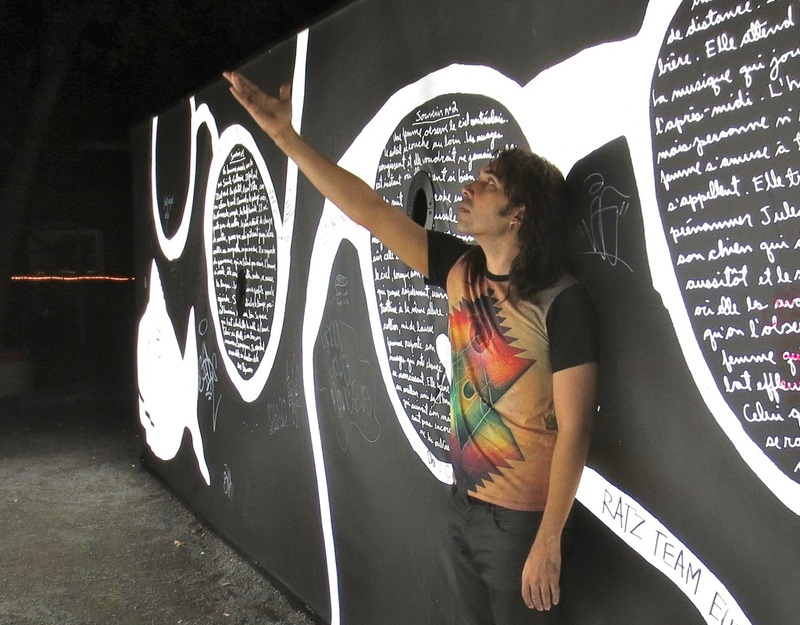 Barley Wik’s sound reflects a musical style as diverse as their individual histories. 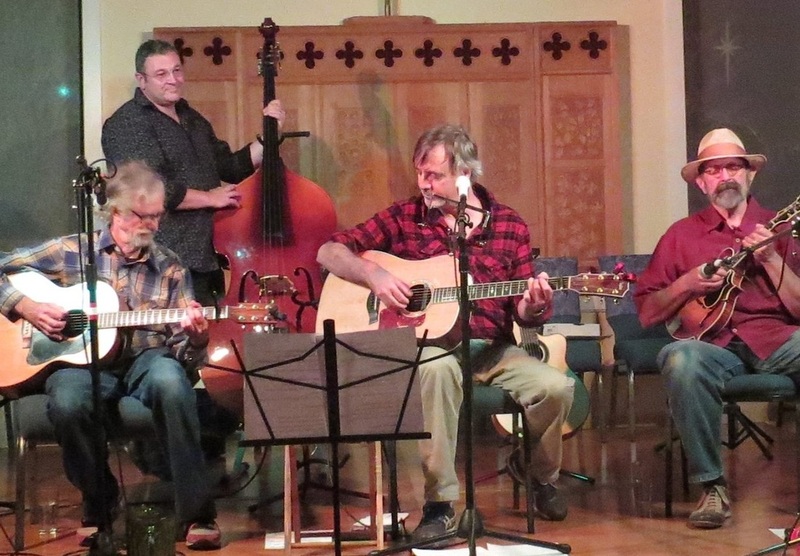 The groups’ roots in the Saskatchewan prairie, small town Ontario, 1960s British styles, and a strong tie to the land merge to create a singular sound that incorporates a range of musical forms. Old-time country, folk, blues, bluegrass and spirituals inspire Barley Wik’s songs. All members are songwriters, and each brings a creativity and honesty to their music-making which keeps it real. Kelt Eccleston (guitar, lead vocal) divides his talents between music and theatre, appearing in Good Timber and Moodyville Tales. 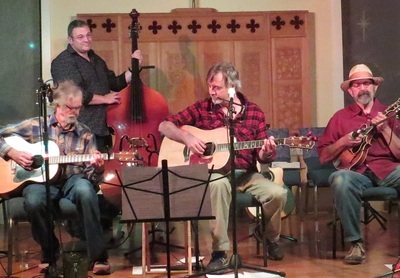 A member of The Ecclestons, has toured across North America, recorded numerous Cds that have been played internationally. 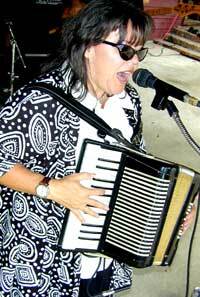 Rose Birney (Mandolin, Harmonicas, Vocals) plays in Four on the Floor and the Chattering Class, & has collected an Associate of Arts in visual arts & a Radio Broadcasting diploma along the way. She is a two-time song writing delegate at the BC Festival of the Arts. 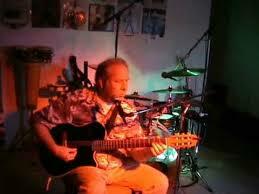 Mark Hellman (percussion, guitar, vocals) actor, musician, composer, dancer, puppeteer, director, teacher, producer. Recent credits include: Good Timber (Other Guys Theatre), The Life Inside (Belfry), Countryside Xmas (Chemainus Theatre), and Tracks of the Troubadour (Story Theatre). Mark directs the Vic High Neighbourhood Choir. 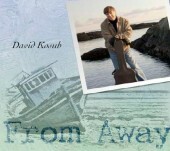 David writes Canadiana story songs, from salt-laden maritime ballads to heart-torn country tunes, kinda pop and kinda down-east folksy. 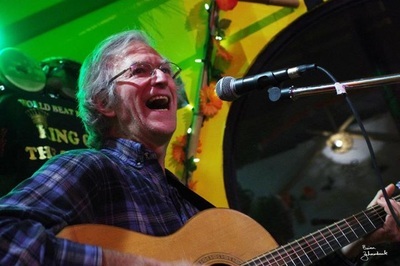 Pete Hawkins has been playing music professionally for 35 years. He covers a breadth of styles include Classical, Spanish and Finger Style, Rock, R&B, Country, Rock, Folk, and Ballads, to which he adds a few of his own originals. 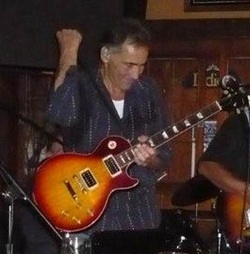 Pete has a silky smooth deep singing voice, and he consistently wows audiences with his guitar playing. 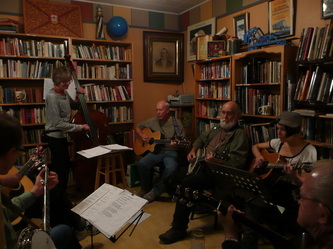 Malahat SwingCats play gypsy, jazz, latin &swing standards, plus originals. 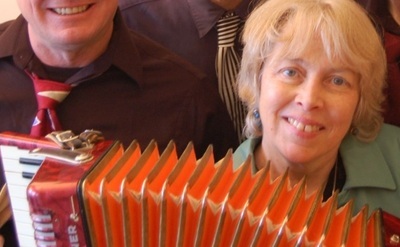 The quartet is: Arlene “AJ” Carson on accordion; Ira Smolkin and Eric Eder on guitars; and Mike Sadava on mandolin. Add harmony vocal arrangements and you’ve got a toe tappin’, finger snappin’, swing tune, good time. A prolific songwriter, Dan Frechette’s songs have been covered successfully by The Ploughboys (“Who Will Take My Place”), Dervish (“My Bride and I”), Emma Cloney (“My Canada,” “My Bride and I”), Jessee Havey (“Dance and Play”), The Duhks (“Who Will Take My Place,” “Mists of Down Below,” “You Don’t See It”), and The Buccaneers (“Everybody Loves You”). 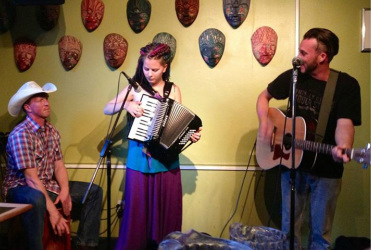 Kouskous is a duet fronted by World Folk Music Artist Gary Cohen, with Middle-Eastern percussion by Amber Woods. Mediterranean inspired guitar stylings & vocal inflections combined with spicy & exotic Middle-Eastern rhythms are the hallmarks of Kouskous' sound. Amusing parodies, fresh and unique interpretations of traditional folk songs & love songs are soulfully sung in French, Ladino (Judeo-Spanish), Hebrew or English. Jamie Dopp and Stephen Dopp. Original folk music from two generations. 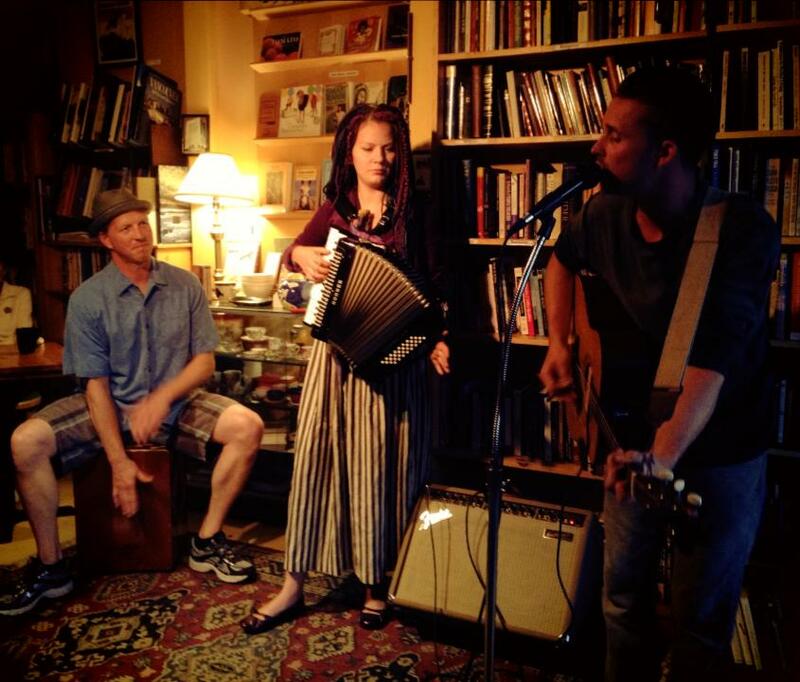 Acoustic guitars, harmonicas and harmonies--with the occasional literary edge. 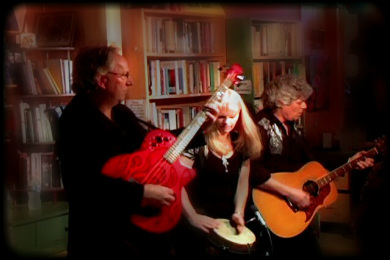 Peet Vuur acoustic guitar & Carolyn Wadel djembe drum with Wayne Dupuis acoustic bass. Tight vocal harmonies & energetic performance combine in a joyful synergy that speaks of optimism & universal togetherness. This earthy rhythmic acoustic offering will cover some old favourites, newer tunes & originals. Hard to label and easy to enjoy, they are a lot fun live & this is one show you won’t want to miss! . 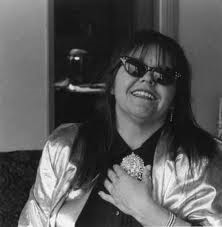 ANJOPA's songs encompass a broad spectrum of genres from Canadiana to Latin, from songs of the heart and spirit to social commentary and comedy. Rick Van Kreugel, harmonies and plays mandolin & lots of other stuff. Together they play cleverly crafted original tunes, instrumentals, & well chosen covers. They are definitely old folkies, and intend to prove it. Fresh out of the studio, after recording their new CD, "The Klez " plays celebratory Jewish music of Eastern Europe and the haunting music of Sephardic Jews who were driven out of Spain in 1492. Together, we have embarked upon a journey through this music. It has taken us to many places and earned us the 2011 &2012 Victoria Balalaika Orchestra prize at the Greater Victoria Performing Arts Festival. The Klez plays the party music of the Jewish people. It is a music filled with love &longing, minor chords, and heart-felt joy. Lucila Nerenberg guitar; Alex Olsen mandolin; Martina Peladeau flute &recorders; Kate Rhodes violin & fiddle; Barbara Pedrick Blied bass. 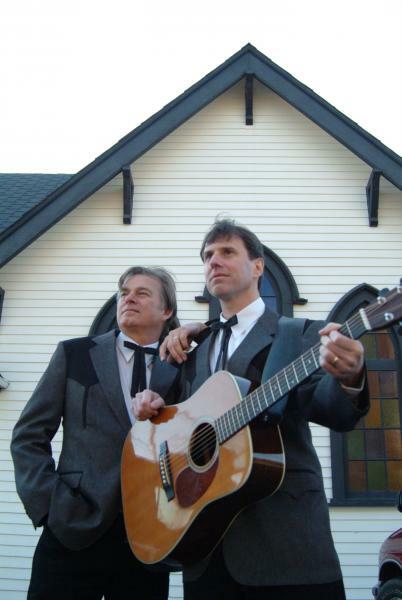 Andrews + Lawrence bring old-time, down-home, finger-pickin' guitar, two part harmonizin Bluegrass Gospel. 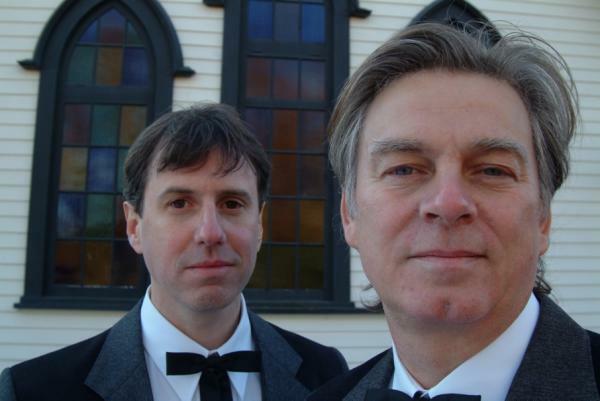 “Andrews + Lawrence have truly beautiful voices that match perfectly in rich, haunting harmonies. True, their music has been likened to the Delmore Brothers and Louvin Brothers of stage and radio fame, but these young men have a singular originality that sets its own value." 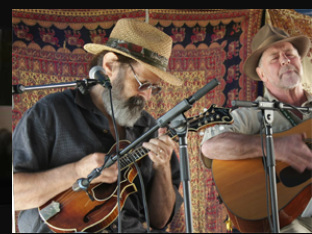 Island Bluegrass Newsletter. These two are a crowd favourite bringing talent, wit and charm. 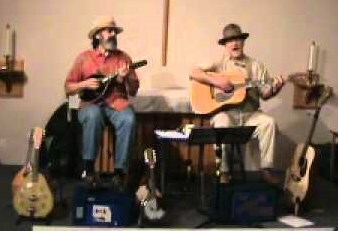 Bluegrass Jam Circle Wednesdays 7 to 9 Come play or come listen. 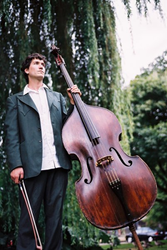 Dan Weisenberger is a multi-instrumentalist, songwriter, and composer living in Victoria, Canada. He has traveled all over North America and much of Europe, playing everything from street corners to concert halls. 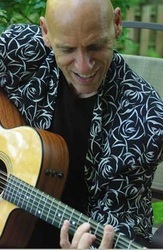 Besides composing music for television, radio and stage he has played slide, acoustic and electric guitars and electric mandola on recordings with Leeroy Stagger and Jeremy Fisher, steel and other guitars on a collection of Hawaiian-inspired songs sung by Ryan Beattie of the band Chet, and Portuguese guitarra with fado singer Sara Marreiros. He is currently working on a CD with North American fiddle champion, Ivonne Hernandez, with whom he has toured for several years. Oliver Swain eats, sleeps and breathes music, as his prolific career shows. 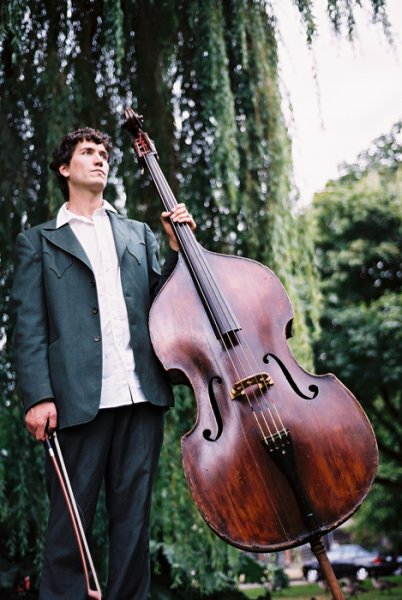 With his pure, finely tuned, spine-tingling vocals that have an astonishing range, and his undeniable skill behind a banjo or upright bass, Oliver grabs the attention of all who hear him, and holds it with his enormous sound and stature. From the most vulnerable and innocent sounding banjo ditties to the brave and imposing bowed bass, Oliver delivers his own brand of alternative folk and traditional music to the masses with a smile and a twinkle in his eye. stand-up bass, Ryan Greaves fiddle, Linda Henson rhythm guitar & vocals. 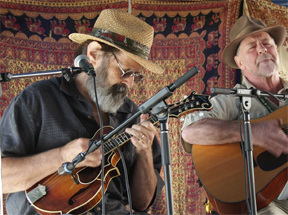 Their repertoire features Bluegrass, “olden goldies”, and long time favourite instrumentals. Add random humor and the odd quip and you have an entertaining round-up of good-time toe-tapping music. An evening of Quirky Blues Lonnie Glass on vocals and guitar with Brad Hawkes on Percussion & Neil Trett on Harmonica. Lonnie & Nel pictured here. 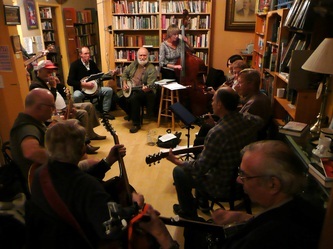 Bluegrass Jam Circle Wednesdays 7 to 9 pm Come play or come listen. Take a gallon of Tom Waits, a quart of Leonard Cohen and a pint of Bob Dylan …mix well… and you’ll get Lonnie. 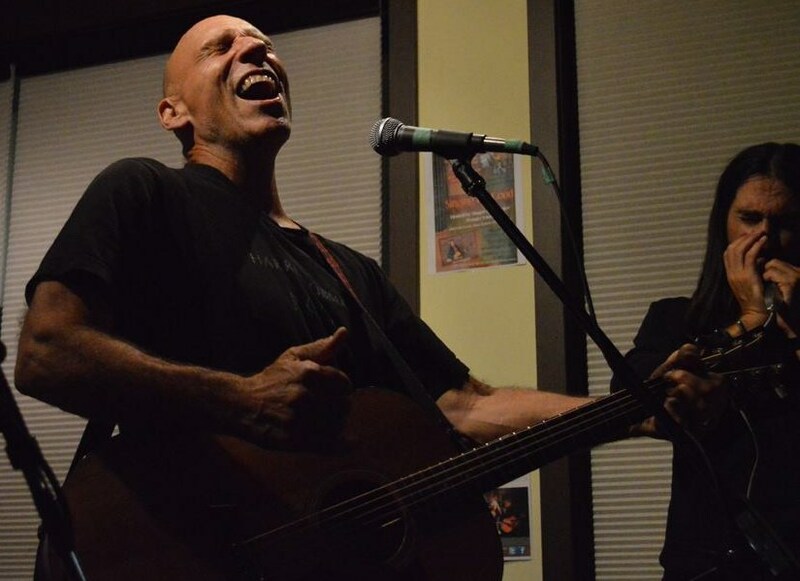 Steve has performed in concert, coffeehouses and various festivals from the Yukon to Newfoundland and throughout the continental United States and Alaska. He has performed for princes and premiers, daycares and nightclubs. His prodigious repertoire and intelligent, yet affecting, original songs seem to strike a universal chord. He has that grizzled look of the archetypal prospector. Grey and tousled hair, stocky build, blue jeans and ruddy cheeks. Steve Slade is what you see. He has honesty given to those who live next door to wilderness. Prospectors and trappers know. Ranchers understand. There is soul-searching reality at thirty below, miles and miles from the next human. 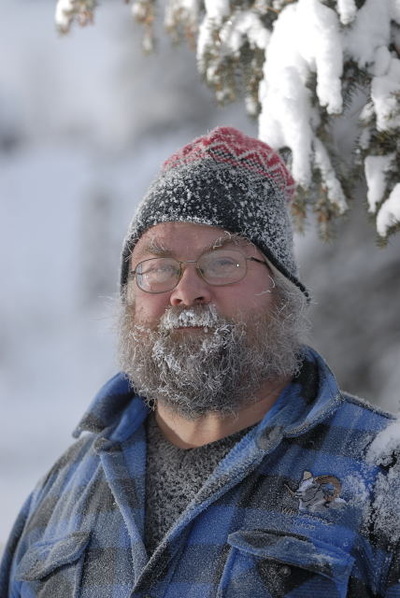 Nothing but truth, self-reliance, and pragmatism matter in a Yukon winter and in all great music. Yukon has been home since 1979, the year Slade became a full-time musician. With his dog and guitar, he hitch-hiked up the Alaska Highway to Whitehorse where he has lived since. There have been treks "outside" for festivals and gigs, but always there is the long trip home to friends, family, and freedom. He has prospected in many musical mines. 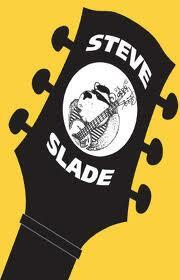 Slade plays jazz, blues, gospel, folk, country, harmonica, guitar, and clown. I asked Steve how he would describe his music. His one word answer was "Good." And it is. "I like it all. Music is music." He is quick to note that reviewers have steered clear of attempts to classify his performances. Why? "People have trouble when they can't pigeon-hole." In the Yukon, Steve has done "a little of everything" to make a living. This is partly the freedom of the North. "If I have an idea to express--if I want to write a waltz--I write a waltz." There are few physical or psychic limits where Slade lives. He travels with his band in the winter, but summers find him producing a concert-in-the-park, noon series for the Arts Society in Whitehorse. Steve is doing what he loves to do. As a singer, he has compiled four or five recordings including several that are now out of print. The Yukon Collection (1995) and Steve Slade: this would be me (2003) are two CD's still in circulation. And his songs are out there. Emily Kearn, a San Francisco folk star, sings his "Family Farm." Aengus Finnan sings "Jenny," "Virginia," and my favourite, "Saskatchewan Rose." I asked how he felt about giving other singers his songs. Steve said everyone can write a song. But when others sing your songs "...you know you've touched a chord in somebody." Jack Booker, with his fabulous voice and guitar playing, delight s the crowd with cool covers from the rock era, Beatles, R&B, power ballads and some of his own originals! ! Scott MacDougall brings a broad variety of tunes, smooth vocals and finger style guitar so there will be some wicked pickin’ duos. Jack & Scott have about 70 years experience between them playing music ! Lots of sing along opportunities. Should be fun! Bluegrass Jam circle Wednesday evenings 7 to 9pm Come play or come listen! 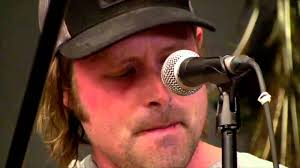 Moncton New Brunswick’s Aaron Murray’s original music songs reflects his folk-country roots. transports the listener to the heart of Acadie with songs that sparkle timeless charm and old-fashioned country soul. Aaron on vocals and guitar, Alan Law on slide guitar, and Rodrigue Dechaine on foot-stomping, syncopated hand percussion. Subtle dynamics, colourful instrumentation and solid, laid-back rhythm section highlight the warm vocals & bring these riveting songs to life. 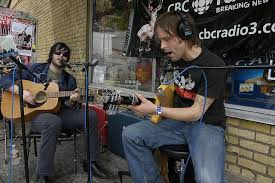 Sit back and hear the East Coast flavoured Canadiana unfold and transcend. Friday Oct 18th, Strange Woods' Mick , Dalena and Rodrigue wowed the audience with a great performance! Listeners compared Mick's vocals to Springsteen or John Fogerty(CCR). 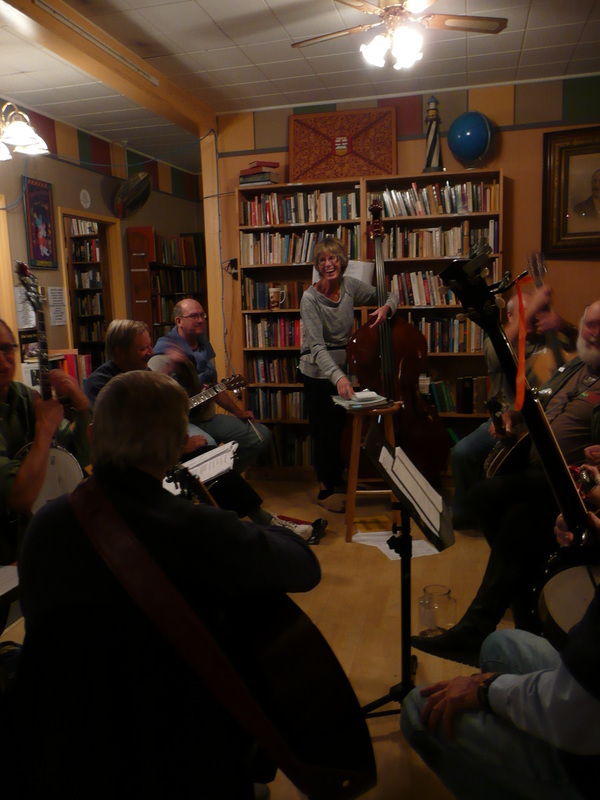 Nota Bene listeners: Bluegrass circle is not the usual Friday night seating format. Mick Gorman pens country-folk grooves in a distinctly Canadiana-inspired mold, an homage to working class troubadour tradition. Rodrigue Dechaine's voix-des-voyageurs hand Percussion. Let yourself be led into Strange Woods, to answer the call of the Wild!"